Cover Photo: Semi-finished Sassafras 16 canoes on display at the 2010 WoodenBoat Show at Mystic Seaport. 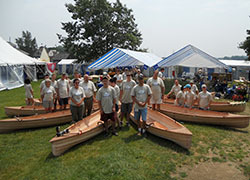 WEST SYSTEM®, Chesapeake Light Craft (CLC) and nine family groups joined forces at the 2010 WoodenBoat Show at Mystic Seaport in Connecticut this June to build nine Sassafras 16 kit canoes. With only a blue and white striped rental tent to shield them from the unseasonably hot weather in Mystic that weekend, everyone labored hard to get their boats a long way toward completion in just three short days. The Family Build event drew a lot of attention from boat show visitors, and many were excited to realize that building a boat of their own was not outside the realm of possibility. The nine Sassafras 16’s were not the only boats being built at the show, but they were by far the most popular choice of the Family Build Weekend participants. On the eve of the Woodenboat Show, WEST SYSTEM technical advisors Bruce Niederer and Tom Pawlak worked with CLC’s president John Harris and his colleague Matt to set up sawhorses and tables, and glue together a total of 72 puzzle jointed planks and 36 scarf jointed inwales and outwales with Six10® Thickened Epoxy Adhesive. This preparation work set the stage for the family builders to make serious progress on their canoes over the long weekend of the show. Tents provided much needed shade for the families, and the CLC and Gougeon advisors as the canoes begin to take shape. Nine families begin the building process by stitching the first strakes together with copper wire. CLC’s well-planned and expertly cut kits feature their LapStitch™ construction set up. Neatly pre-drilled holes allow for easy stitching with copper wire, quickly resulting in a round-bottomed, traditional-looking lapstrake boat that is strong, stiff and beautiful. Temporary and permanent bulkheads are wired in place. By the end of day one, all of the strakes were stitched in place and the laps were glued with Six10 Adhesive. On day two the bottoms of the interiors were fiberglassed. The now rigid hulls were rolled over and the copper stitching was removed. By the end of the first day the Sassafras 16 hulls and bulkheads were stitched into place and the laps were glued together with Six10. On day two, fiberglass cloth was applied to the interior boat bottoms with WEST SYSTEM 105 Resin® and 207 Special Clear Hardener ®, and the inwales and outwales were glued into place and clamped. Everyone installed their decks and seat hangars on the third day, and sanded the boat bottoms. The very practical, puzzle joints make it easy to turn short planks into long planks. With the copper stitching removed and the outer lap joints filleted, the hulls are ready to be rolled upright again to install the inwales and outwales before the end of day two. Participants car-topped their nearly completed canoes home. WEST SYSTEM sent each group enough resin, hardener and filler to finish the job by glassing the exterior bottom of the hull, sealing the rest of the hull in three coats of 105/207, installing the cane seats and painting or varnishing their finished canoes. All of the inwales and outwales are glued, clamped and left to cure overnight. As the saying goes, “you can’t have too many clamps.” On day three the decks were installed. At the end of the show, the weary families headed home to install the thwarts and seats and get started on the big tasks, sanding and finishing. will be ready for the water. In preparation for the Mystic Family Build Weekend, Bruce Niederer, Julie Van Mullekom and Grace Ombry built a Sassafrass 16 in the Gougeon tech department shop. They gained some valuable hands-on experience before Bruce, Tom Pawlak and Alan Gurski went to help families at Mystic build their Sassafras. Left—Nick and Bruce paddle out to greet the HMS Bounty as it heads up the Saginaw river to the Tall Ships Festival. Twelve tall ships visited Bay City for the three day festival held July 16–18, 2010. Gougeon summer intern, Nick Wisner and Bruce Niederer take the Sassafras on her maiden voyage. Though not completely finished, a gray pigmented epoxy coating keeps it watertight. This entry was posted in Boat Construction, Canoe & Kayak Construction, Epoxy Products, Wooden Boat Construction and tagged 2010 WoodenBoat Show, Bruce Niederer, Chesapeake Light Craft, CLC, Epoxyworks #31, Fall 2010, John Harris, Six10, Tom Pawlak, West System Epoxy on May 12, 2015 by ewadmin.